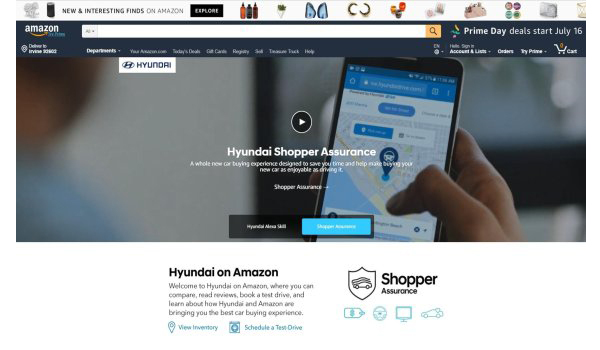 Hyundai Motor has launched a digital showroom on Amazon.com, further deepening its partnership with the world’s largest online retailer to boost car sales across America. The Korean carmaker said on Thursday the new digital showroom accessible directly through the Amazon Vehicles allows customers to compare pricing, read reviews, book test drives and explore the exterior and interior details of Hyundai cars through a 360-degree VR experience. The automaker is the first to offer such a service on Amazon’s automotive platform launched in 2016 for users to research on cars, auto parts and accessories. The new digital showroom (Amazon.com/Hyundai) represents another development in the Hyundai-Amazon alliance that can be traced back to their co-promotional campaign from 2016 that allowed Amazon Prime members to schedule on-demand test drives. Hyundai’s premium brand Genesis launched a remote car control function by embedding Amazon’s voice aide Alexa into the car system. Hyundai Motor is ramping up marketing efforts in the U.S. to sustain the momentum of recovery after a 10 percent sales drop in the first quarter. Recent sales showed signs of growth with the local inventory level, one of the carmaker’s key performance indicators, improving to 35 months this year from 44 months at the end of last year.